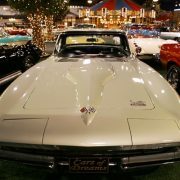 By 1965, end-of-year Chevrolet sales figures clearly indicated Big Blocks were outselling Small Blocks, in all divisions, so it was determined Chevy would start adding Big Motor options to the line-up. 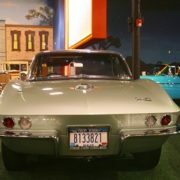 By 1966, Detroit was no longer content with simple High Performance. 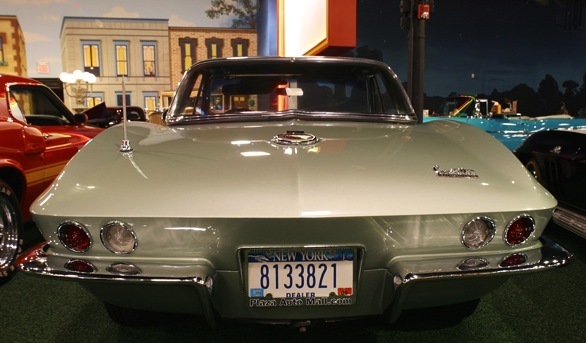 A car had to also “look the part” and was also judged on it’s “High Performance Image”. 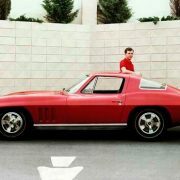 By now Pete Estes took over, fresh from Pontiac Division, where he and fellow collaborator John DeLorean had literally ‘created’ the First Muscle Car (GTO). Estes followed the lead of past division Chief Engineers…he boosted motors. 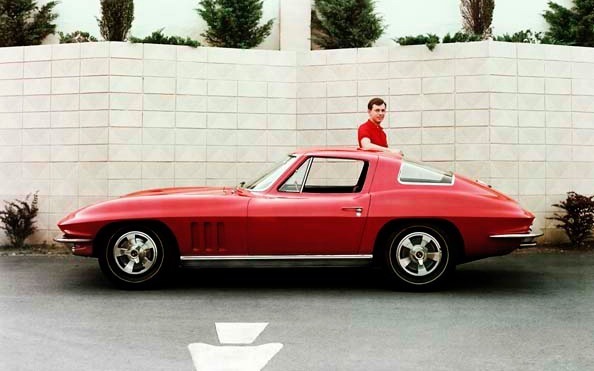 The Corvette got a huge bulge in the hood ( on the Big Blocks ) that wrecked Shinoda’s streamlined styling but, the Good News is that the Vette also got a plated, cast Ferrari-type egg crate grille ( to replace the extruded alum. ones), Ribbed Rocker Panel Moldings, and Chrome Plated Exhaust Bezels. It lost the Roof Vents on the Coupes but, gained Spoke-Mag-Style Hubcaps, an extra batch of Pleats in the Seats ( to help eliminate splitting). 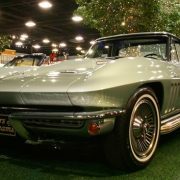 It got a Vinyl Headliner and a even bigger motor ( 427, instead of the 396). .
“L72” was the 427/425 hp engine, “M-22” the Heavy Duty 4-Speed, “C48” Heater Delete, “N14” Side Exhaust, “F41″ Special Performance Suspension ( bigger sway bars, 9 leaf spring instead of 7),”N03” 36 Gallon Gas Tank (rare- only 66 built ) etc. etc. 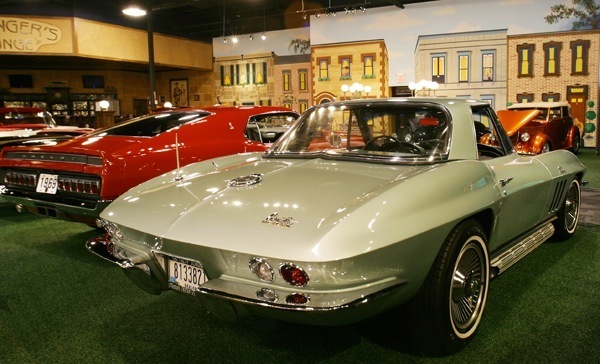 Color choices were up to Ten and Vette’s could be ordered in everything from “Sunfire Yellow”, “Mossport Green” (1 yr. only), “Trophy Blue” & “Laguna Blue” (also, one-year-only colors), or one could still order the outrageous “Silver Pearl”. 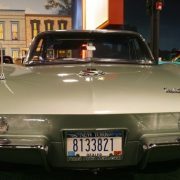 G.M.’s Bill Mitchell said his favorite color was indeed ‘Blue’ so, the ’66 color roster carried 3 different shades of Blue. 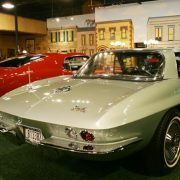 In fact, Harley Earl’s own personal custom built 375 h.p. 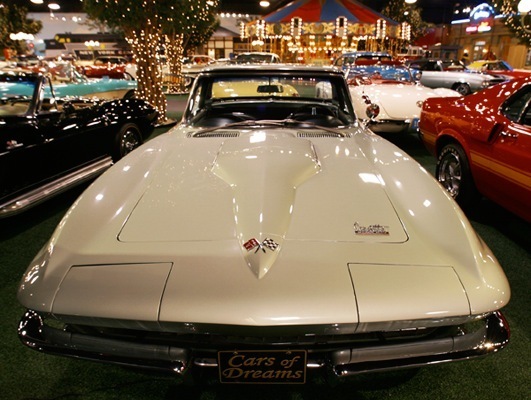 fuel injection Stingray Convertible with through-the-sides Chrome Side Exhaust was Nassau Blue. 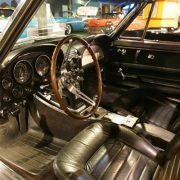 Thankfully, only 2% of the Corvette production had a 3-speed Transmissions but, 89.3% had a the more desirable Four Speed. 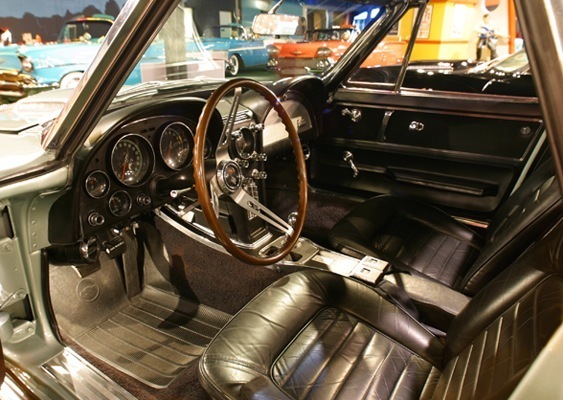 20.2% had Power Steering and 13.2 had a Telescopic Wheel. 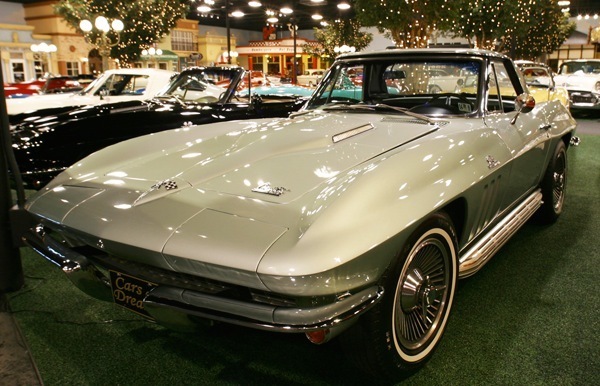 Most noticeable fact is, starting with 1966, the Corvette Sting Ray’s were built better (noticeably tighter)… especially in the Convertible. 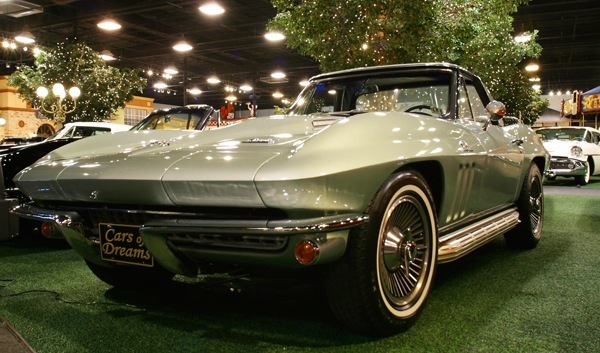 Still a throwback from the Stingray Special Racer and XP-720, the 1966 Corvette Sting Ray carried on the Mid-Year Tradition with Quad headlights that rotated closed when not being used. 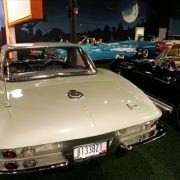 They still retained the doors cut-up into the roof line (on the Coupe), the lack of an actual trunk but, kept the Racy Styling. 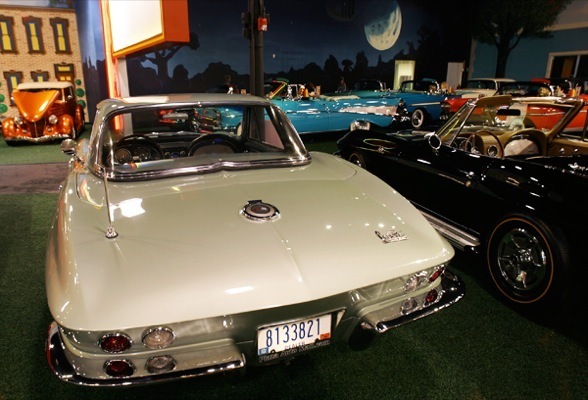 Corvette fans still scoffed at frills as fewer than 12% of the cars produced came with ‘Creature Comforts’ like Air Conditioning and Leather Seats. 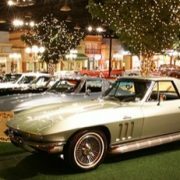 They still carried the revolutionary Independent Rear Suspension with Half-Shafts, Lateral Struts, Radius Rods and a Transverse Leaf Spring. 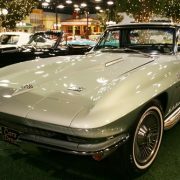 Consequently, they rode 100% better than the old Cove Corvette’s and handled like a Modern Car (especially now, with new radial tires added).